I mean a 235/40 could work. Still, I highly suggest getting 225/40 for front and rear. Don't go staggered. I am saying this because of the many different staggered setups I had. None of them were as good as a square setup. Depends on the exact tire. Tires can vary in width quite a bit. But, I think 10mm will work. 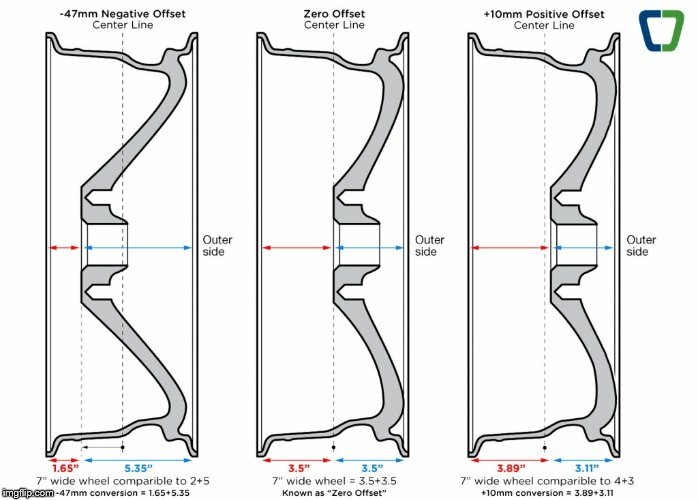 Based on the wheels directory for a 9" wide rim to achieve perfect flush I'd need a wheel with +48 offset on the front and +38 on the rear (dropped 1"). That's not how offset works. Also, the wheel directory does not take into account that most people want a bit of negative camber. A 9" wheel that is +48 offset requires coilovers to fit. A spacer adds distance between the spring perch and the wheel/tire. Negative camber decreases the distance between the wheel/tire and spring perch. I have 18x9 +42 wheels. I have added 12mm front and 15mm rear spacers. This makes my offsets +30 front and +27 rear. For positive offsets; you subtract the spacer. A +42 wheel with a 5mm spacer makes it essentially a +37 wheel. A 1" drop will net you -1.5 to -2 rear natural camber. My natural camber from 1" drop springs was -1.8 left and -2.2 right. This didn't cause any uneven tire wear; I drove it 65,000 miles this way. LCA will fix this issue if you want. You will need some front camber to at least match the rear. Camber bolts are around $20 and easy to install. They are good for about -1.5. This is good for DD. A 1" drop, 18x9 +42 wheels with a 10mm spacer, and a set of camber bolts will look good. You may not need spacers at all, depending on what you consider flush and how wide of a tire you choose. The wheel directory is a great resource; I look through it all the time. Leonardo, I wish you were in FL so I can pay you a few beers. What's LCA? For 10mm spacers I'll need longer studs right? LCA = Lower Control Arm. It will help you fix your rear camber as there is no camber adjustment on these cars. And yes with 10mm spacer you most likely will need to run extended studs. LCA = Lower Control Arms. Good lower price LCA - not 100% necessary, but really nice to dial everything in. Yes, extended studs are needed. I suggest these. These spacers are a great deal! I have 245/35/18's. They are stock diameter and fit nicely on a 18x9. This is the size I would suggest. Hey Leonardo, my hubcentric conversion spacers came today and my wheels look good on em. However, how can I verify they are hub centric? There is a lip that goes on the hub, but it still moves around a bit. I'm guessing when I throw on the lug nuts it came with it will center it and prevent movement? Cool post some pics of what your wheels look like on your ride! What spacer/adaptors did you get? Did you order spacers with a 56.1 hub bore? If they are 56.1, they should slide on the hub with almost no side to side movement at all. Or figure out the ID of the wheel adaptor and get ones that fit them. I can help if you can't figure it out. Hopefully the install on the rear goes smoothly and you get your tires soon. I look forward to seeing some pics! Ok, my bad I was thinking of 50mm extended in the rear. If your extended studs are OEM length (or only 5mm longer) you can install them without removing the rear hub.